You want mountain views at a reasonable price? You can see the mountains from every window (even the bathtub!) Enjoy the sunrise while drinking your coffee in the updated kitchen or walk out on the oversized deck and watch sunsets and elk in a tranquil setting. 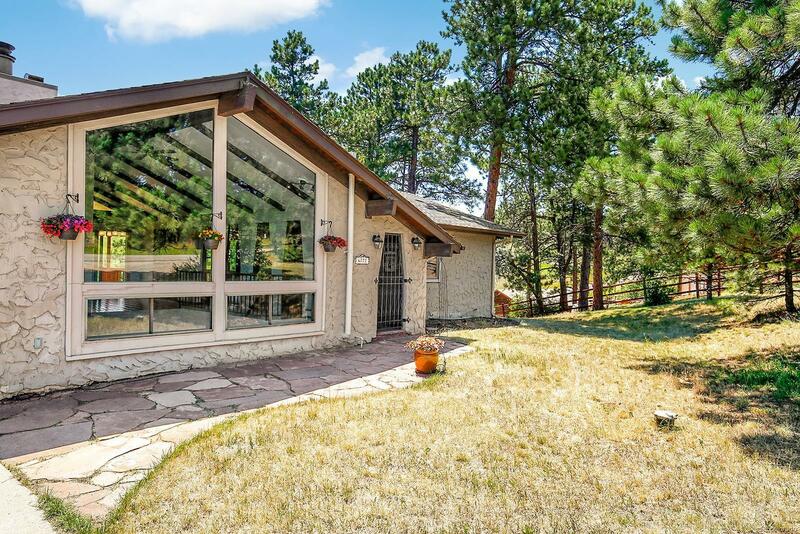 Open floor plan, vaulted ceilings, exposed beams, whole house surge protector, strong wireless internet connection - rare in the mountains! Garden in the tiered and fenced garden beds with drip system. Live off the grid with a few minor changes. Zoned for horses, chickens & animals. Built-in bar and possible theater room area in the walk-out lower level for entertaining or cozy family gatherings (and yes, you can see the mountains from there too!) Sunny driveway for easy snow melt in the winter. On-site RV parking and riding lawn mower included. Mountain privacy and relaxation with city living convenience. Easy commute with 9-13 minute drive to C-470. This charming cottage is just the mountain retreat you have been waiting for!